There is nothing like a ghastly meal to send our trick or treaters back home with tales of the unbelievable. You can spice up a Halloween party with some of these recipes that are sure to strike up conversation. There is such a variety of grossed out meals that make children laugh and parents upchuck. You really need a sense of humor to enjoy these treats, none the less they are all delicious and they are all made for fun, so come along and join us in the Funky foods of Halloween. Use these for party favors, hanging them from the ceiling until ready to distribute to your guests. 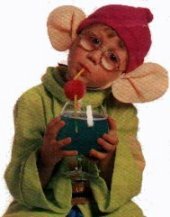 Take a round-headed lollipop. Lay the head in the center of a white handkerchief, facial tissue, or cloth square. Gather the handkerchief down around the stick and tie tightly just below the head with a rubber band, twist-tie, or string. Add 2 black dots for eyes. You can also use these ghosts as an invitation to your party. Write the party date and location around the outside of the handkerchief before making the ghosts. If you plan to mail them, you might want to use flat round lollipops and padded envelopes. Serve soft-set lime gelatin out of a bowl. Don't cut it nicely - slop it out. Make Rice Krispie® Treats. The directions are on the cereal box. Form the into balls, about 1 or 2 inches across. Add a pastel M&M® or other small round candy for the iris and dot the candy with frosting or gel for the pupil. A big hit with the younger crowd! Buy some new latex gloves. Wash one out and fill with water. Fasten the arm closed with a twist-tie or rubber band. Freeze it. Float it in the punch before serving. Prepare cake mixes and bake according to directions (any size pans). Prepare pudding mix and chill until ready to assemble. Crumble white sandwich cookies in small batches in food processor, scraping often. Set aside all but about 1/4 cup. To the 1/4 cup cookie crumbs, add a few drops green food coloring and mix using 5. When cakes are cooled to room temperature, crumble into a large bowl. Toss with half the remaining white cookie crumbs and the chilled pudding. (Mix in just enough of the pudding to moisten it. You don't want it soggy. Combine gently). Line new, clean kitty litter box. 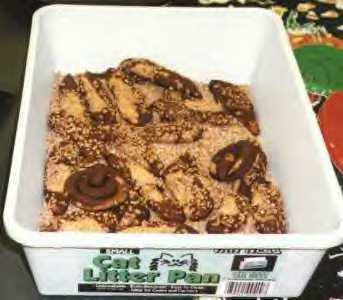 Put mixture into litter box. Put three unwrapped Tootsie rolls in a microwave safe dish and heat until soft and pliable. Shape ends so they are no longer blunt, curving slightly. Repeat with 3 more Tootsie rolls and bury in mixture. Sprinkle the other half of cookie crumbs over top. Scatter the green cookie crumbs lightly over the top. (This is supposed to look like the chlorophyll in kitty litter.) Heat 3 Tootsie Rolls in the microwave until almost melted. Scrape them on top of the cake; sprinkle with cookie crumbs. Spread remaining Tootsie Rolls over the top; take one and heat until pliable, hang it over the side of the kitty litter box, sprinkling it lightly with cookie crumbs. Place the box on a newspaper and sprinkle a few of the cookie crumbs around. Melt cheez whiz in the microwave according to jar directions. Allow the cheese to cool slightly in the jar. Carefully stir in food coloring using just enough to turn the cheese a pale snot green. To form boogers: Dip and twist the tip of each pretzel stick into the cheese, lift out, wait twenty seconds, then dip again. When cheese lumps reach a boogerish size, set pretzels boogerd on wax paper to cool. Preheat oven to 325 F. Combine dry ingredients. Lightly grease a cookie sheet. In a large bowl, beat together butter, sugar, egg, almond extract and vanilla, beat in dry ingredients. Cover and refrigerate dough for 30 minutes. Place cookies on the prepared cookie sheet and bake for 20-25 minutes or until pale golden. Let cool for three minutes. If desired, lift up almond and squeeze red decorator gel onto nail bed and press almond back in place so gel oozes out from underneath. Remove from cookie sheet and let cool on a wire rack. Repeat with remaining dough. Note: Make cookies smaller than you think they need to be, as they spread when cooking. Our witch has fat fingers because we didn't heed our own advice. 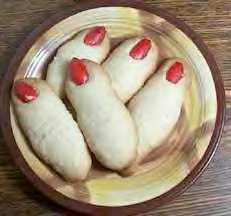 Here's a great appetizer plate for Halloween. 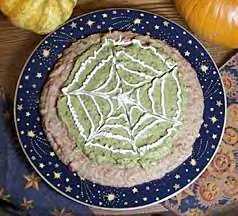 Bean dip is topped with guacamole and sour cream forms a spooky spider web design. Serve with tortilla chips. You can easily make this a low fat snack by using our Low Fat Guacamole recipe, low fat sour cream and baked tortilla chips. Spread a layer of bean dip over a large round plate. Carefully spread a layer of guacamole over this. Put sour cream in a pastry bag fitted with a small round tip and pipe concentric circles on the guacamole. Take a toothpick or wooden skewer and drag it through the sour cream from the center outward to make spider web design. Note: If you don't have a pastry bag, put sour cream in a small plastic Ziplock bag, cut off a small piece of the corner and pipe sour cream this way. Tip: Make Halloween shaped tortilla chips by using cookies cutters to cut shapes out of tortillas, then deep fry them until crisp. You can also make low fat tortilla chips by baking your cutouts in A 350 F oven. In either case, sprinkle with salt. Chips made of blue corn tortillas look especially spooky. When they are full, insert the sticks, you may have to work them into the chocolate a little and top it off to seal them in. They may look a little bumpy but they will level out as the chocolate settles. Place in your refrigerator to set. You can also look for different molds that have witches, skulls, etc. and fill them accordingly. To remove after they are set, just lift by the stick, they should easily pop right out. If they don't come out, just bend the mold slightly, like getting ice from a tray. You can use candy paints or glazes at this time to add some color. Or use decorating gel or frosting to add faces! For a Halloween party, serve on a large serving tray or decorative plates. For treats, wrap individually in those little cellophane bags for suckers. You can find orange ones during the Halloween season. A very tasty little treat! I guarantee that they disappear faster then a ghost in a grave yard! Slit open each pita along 1/4 of its edge to make a pocket, and spoon 1/2 cup shredded cheese, and spaghetti sauce to taste, into each one. Place the stuffed pitas on an ungreased cookie sheet. Bake for 15 minutes, or until the pitas turn golden brown. With a knife, poke a hole in the top of each pita. Carefully squeeze pitas, they'll be hot, until a little melted cheese oozes out of the hole. Dab a little more spaghetti sauce around the hole and arrange on a platter. Now you can not only pick your pimples, but you can eat them too! Any other veggies you'd like. Following the instructions on the pizza crust tube for pre-baking the crust after you shape it to the Jack-O-Lantern pan. After the crust is done, cover it with the pizza sauce of your choice, add pepperoni and any veggies you want. Cover liberally with the cheddar/mozzarella cheese mix, making sure to cover anything underneath it. Cut green peppers in to thin slivers, save a larger piece to make the stem. Lay pieces out to make the indentations of the pumpkin. Cut pieces of pepperoni to make the eyes, nose and mouth of the Jack-O-Lantern. You could also use a yellow pepper to do this for variation on a meatless pizza. Here's what mine looks like before baking. Bake according to the instructions on the pizza crust wrapper, usually about 20 minutes, but you'll know when it's done. The cheese will be all bubbly and the crust will be golden! It looks so yummy, you won't be able to wait to taste it and, maybe, share with all my spooky friends! Thaw sherbet for approximately 15 minutes and place in a plastic tub. Add lemonade (prepared according to directions) and 7-up. Sherbet will melt and turn mixture day old bathwater grayish-brown. Float a handful of green, yellow and white tiny after dinner mints (tiny bars of soap) on top of the scummy punch. You will need Keebler fudge striped cookies, Hershey Kisses and a tube of orange decorator icing. Turn cookies upside down so that the chocolate side is up. Use the orange decorator icing to pipe around the hole in the center of each cookie. Place an unwrapped Kiss on the icing circle. Finish by piping around the base of the kiss and drawing a little bow. Peel eggs cut in half lengthwise. Remove the discard yolks. Fill the holes with cream cheese. Press an olive into each cream cheese eyeball, pimiento facing up, for an eerie green iris and startling red pupil! For a final touch, dip the tip of a toothpick in red food coloring and draw broken blood vessels in the cream cheese. Cut avocado in half and scoop out the pit. Scoop avocado out of the shell and put in the bowl. Add sprouts to the avocado meat. Mash with a fork. It is ok to leave some lumps. Set the mixture aside. Divide the grated carrots among the four salad bowls. Make walnut size hairballs from the avocado mixture and arrange them on top of the grated carrots. Pour Italian "saliva" dressing over hairballs and serve. Core tomatoes with a carrot peeler or knife. Drain excess tomato juice. Using a butter knife, fill holes in tomatoes with cream cheese. Give each pimple a gentle squeeze and arrange on a platter. Dissolve Jell-O in boiling water, Mix in alcohol, Set in freezer. Just before it gels, whip it with a whisk & let set. Shake over ice & Strain into cocktail glass. Spoon Ectoplasm carefully into glass. It will float, giving an eerie effect. Increase amounts to fill punch bowl & add a can or two of Citrus Soda (like Mountain Dew or Wink). Keep cold until ready to serve, Spoon in Ectoplasm just before serving & Garnish Punch bowl with Gummy Worms. Planning a room party for your child's class can seem daunting, but it doesn't have to be! Most of the room parents are very happy to help in the lower grade classrooms. With some planning of games and treats, you can have a lot of fun. I wrote this article because last year, when I was looking for new ideas for my middle son's room party, I could not find much. Everything I found was far too grotesque for a kindergarten party, and expensive too! Here are some of the ideas I've used for K-2nd grades, some are easy enough for preschoolers to do as well. as the kids get older, the classroom Halloween parties don't seem to be as common, but you could use these ideas for a home Halloween party as well. Part 1: Let the Games Begin! We are limited to a 45 minute party with almost 30 kids, so we pick 3 of these games, and figure that we'll probably get to two of them. One of the most successful parties we did involved setting up stations. We had 3 games set up, so that the kids could rotate among them. Everyone got to play all of the games and eat lots of treats within our 45 minute time frame- a big success! At another party, we decided along with the teacher to schedule the party right after lunch. We did the games, fed the kids treats, and then sent them outside to play and run all of that sugar off! Pumpkin Bowling: Get a hold of 4-6 plastic pumpkin buckets and a small ball (plastic bowling balls are perfect). Stack the pumpkins in a pyramid on a hard surface and let the kids bowl to their hearts' content! Assign a little helper to assist you with picking up the pumpkins and stacking them. This was a big hit with the kindergartners! Spider Toss : We were looking for a different take on the bean bag toss, so I made a game out of a cardboard box, some fabric scraps, and fabric paint. Basically, kids throw spider beanbags into a "web" with holes. Web Box: The easiest way to make this is to spray paint the box black, paint on a web with 3-dimensional fabric paint, and then go back and cut 5 or 6 holes between the webbing, evenly spaced around the spider web. Spider bean bags: Cut two circles of black fabric and 8 little spider legs for each spider. Pin circles right sides together, pin top of 4 legs to each side (right and left sides) of spider body, remembering to pin the top of the leg to the outer edges to be sewn (don't pin the foot there). Stitch around edges, leaving a 2 inch opening for turning. Turn the spider body right side out, making sure all of the legs have been stitched on correctly. Fill with dried beans and slipstitched closed. Face Painting: Paint a spider, a pumpkin or a ghost on their cheek-kids love this! Costume Parade-My kids' school holds a costume parade every year, and the kids love it! They bring their costumes to school in their backpacks and dress up for the parade and party. If you can't parade the kids through the school, perhaps you can parade them through another classroom (hold a joint class party) or march them around the room. At home, have a parade down the street, but have some helpers with you to round up straggling troops. Do this during daylight, not nighttime, and be careful of traffic. Ghost Guess : Kids are divided into two groups. One group goes out in to the hall and a mom puts a sheet over him/her. They then go back into the classroom and the other group of kids has to guess who is under the sheet! Pin the Nose on the Pumpkin : Pin the nose on the donkey Halloween style. Easy to make with felt and Velcro. Mummy Wrap- a big hit with older kids, but requires lots of toilet paper! Divide kids into teams of 2. One person stands still while to other wraps them in toilet paper as a mummy at the start signal. Kids are given 2 minutes or so to wrap their friend up, first team to win gets a prize. Then, the wrapped-up kids burst out of their wrappings and it's their turn to wrap up their buddy. Have the kids help clean up the toilet paper. We did this to the "Monster Mash" song, it was a big hit! Ghost Bingo-Make bingo cards from poster board but instead the word bingo, put "ghost". If you really want to go all out, the kids could even have Halloween shapes that they put on the bingo card instead of the standard plastic chips or pennies. When the kids gets bingo, he calls out "ghost". Make sure there are lots of 7's and 13's on those cards! Spooky Story Round Robin- sit kids in a circle. Someone starts the story (with something like "It was a dark and spooky night..."), and then the person sitting next to them continues the story, adding a sentence or two. Depending on the age, you can set the rules about how scary the story can be. Spooky ABC's- Same idea as above, but children name spooky items with the alphabet. Each child must repeat the letters and spooky items said before his/her turn. Halloween Tic-Tac-Toe-Make the tic-tac-toe cards from orange or black poster board. I like to make the tic-tac-toe pieces out of juice can lids. I paint the lids, then glue on a felt bat, ghost, spider, or pumpkin. I always save those lids (much to my husband's dismay! ), so I have a ton of them. You could also have the children make their own pieces by drawing on construction paper and cutting them out. Musical Monster Mash-musical chairs with spooky music. Older kids might like to do a "Monster Mash Contest" where he who dances the craziest wins! I'm partial to the Monster Mash, They're Coming to Take Me Away, and all of those other great, spooky 50's songs. "Thriller" by Michael Jackson would be a good one too. Try these if you have a smaller group to work with, or time to fill. They are messier than the first games, but lots of fun! Apple Bobbing-old fashioned and fun, but if it involved water and kids, you know if it will be messy! Great to do outside if the weather is decent. Spider fishing-Put a plastic spider and a magnet on the end of a homemade fishing pole (stick with string tied on). Fill a small bucket, washtub, or baby pool with water. Add plastic flies with paper clips attached to them, so that the magnet will pick them up. You could also just put the magnet on the end of the fishing string and attach the paper clips to cheap plastic spiders. Go fishin'! Spider Piñata-Make a piñata out of paper mache! It's not that hard. Mix one part water and one part flour to make a paste. Dip newspapers in the paste, and then spread over a good-sized balloon. When the newspaper has dried, pop the balloon and cut a slit in the top for placing candy. Spray paint the body black and add legs- the can also be made out of newspaper, or toilet paper/paper towel/gift wrap tubes. You can also use cardboard or chenille bumpies (from the craft store). Open slit at top and fill with candy, taping it back up (black electrical tape shouldn't show). Hang from a tree and let the kids go at it! Just make sure they hit the piñata and not each other! These are great classroom and room party activities. Some of the messier ones are best done with the smaller groups, or with lots of helpers and plenty of time. Gourd Painting- what kid doesn't love painting? One year, I accidentally planted ornamental gourds instead of pumpkins, and I had TONS of them. We brought them in to my son's class and all of the kids got to do some "pumpkin painting". We painted the small, round ones as pumpkins, the tall, strange-shaped ones as ghosts. The bumpy ones got to be warty witches and Frankenstein's. After they dried, the kids took them home to decorate for Halloween! This was a very fun project! Paper Bag Pumpkins- fill brown lunch bags with newspaper, and let the kids paint their own jack-o-lanterns. Great alternative to painting gourds if you don't have them. Pompom Spiders- even young kids can make spiders by gluing two black pompoms together and adding black pipe cleaner legs. Add wiggly eyes for fun. Pompom Pumpkins-Kids can make a pumpkin from an orange pompom and black and green felt. You can even make the pompoms out of orange yarn. Clothespin People-Those DMC patterns for clothespin people are great for elementary school kids. Embroidery floss is wrapped around the clothespins and tied off or glue down. There are some great Halloween patterns to use here, or kids can design their own- perhaps a trick-or-treater that looks just like them! Markers, yarn and construction paper can also be used to embellish. Spooky Hands- Trace the child's hands, extending the drawings of the fingers to look long and pointy. Let them cut the hands out and decorating them with markers, stickers, paints, etc. Leaf Print Shirts-Have the kids gather leaves outside. Paint the leaves varying shades of red, yellow, orange, green, etc. and press onto a white shirt lined with cardboard (so that the paint won't bleed through the other side). You can add a fabric paint medium to regular acrylic paint or just use fabric paint. Milk Carton Haunted Houses-Ask the teacher if the kids can save their milk cartons for a Halloween project, making sure there are enough saved so there is one for each kid, plus extras for siblings and mess-ups. Kids glue graham crackers (or cardboard squares) to sides of milk carton, and black construction paper or poster board to the top as the roof. Kids can decorate around the windows with candy corn or other Halloween candy (similar to a gingerbread house) or can paint, use markers, or stickers to decorate their spooky house. At home, you could make an entire spooky town out of cereal boxes, milk/buttermilk cartons, shoe boxes, etc. Add some ghost pops (below) coming out of the roofs and "windows" of the house. Fun! Ghost pops-I hand these out every year for Halloween. They are so simple, and yet kids still think they are special! I was worried that all of the "cool stuff" being handed out would make my ghost pops look pretty plain, but kids love 'em. They can make them too. All you need is a box of tissue, black string, a black marker, and a bunch of Tootsie and/or Charm Pops. Place the tissue over the top of the lollipop, tie in place with black string, add eyes and a mouth with black marker. Done! Last year I saw Martha Stewart make cat and pumpkin pops on her show. All you need is some gift tissue paper in black or orange, and some embellishments- green construction paper for the pumpkin top and leaves, or black construction paper for the cat's ears. You can use white out for the eyes, adding a pupil with a black felt tip pen. These were cute, but too much work for me- I make at least 70 ghost pops a year! I let the kids help, they love it. Halloween masks- Kids can make masks out of poster board and a variety of paint, feathers, glitter, crayons, etc. They could be "Mardi Gras" style masks (covering just the eyes), full face masks, or whatever their hearts desire! Punch holes on the sides and add yarn to hold mask on, or glue to a stick like the fancy masquerade masks. Ghost Feet-This is a lot of fun, but messy. The kids take off one of their socks, you dip the bottom of their foot in a pan of white tempera paint, and then have them make a footprint on a black piece of paper. Immediately wipe their foot off with a paper towel. When the paint is dried, the picture is turned upside down, so that the heel become the head and the toes become the bottom of the ghost. The kids can decorate their "ghosts", adding eyes and mouth, a bow tie, hair, whatever they like. My son Beau refused to do this at school because the teacher wasn't wiping the kids' feet off (according to him, I find it hard to believe). He didn't want to get his feet dirty. This is the same child that makes mud pies and climbs trees for hours. Go figure! 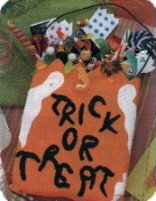 Spooky Puppets- Kids can make ghost, witch, cat, owl and pumpkin puppets from felt, brown bags, or paper lunch bags. Glue sides together or sew/blanket stitch/whip stitch felt together for them. Let them put on a puppet show. cake that your kids will love. Try this easy recipe for success! Prepare cake as package directs. While cake is baking, prepare frosting and decorations (below). When cake is completely cooled, pour the frosting on top and spread evenly. Carefully place your critter decorations (below) on top of the frosting and press down gently to set. Get ready for some happy faces! The key here is to use your imagination. We have given you a few examples, but create whatever critters you like! Using 5 gumdrops and two cinnamon hots per worm, line up the gumdrops, one in front of the other. Use a toothpick to create indentations in the leading gumdrop. Insert cinnamon hots for eyes. Place two large marshmallows next to each other, on end. Place a cinnamon hot in the center of each marshmallow for eyeball. Using two 2-inch long licorice vines, create angry eyebrows over the cinnamon hots. Use miniature marshmallows for the eyes and miniature chocolate chips for the eyeballs. Use a toothpick to create a little hole in each marshmallow top, then insert the pointed side of the chocolate chip into the marshmallow. Using a toothpick, poke three holes completely through the sides of an orange jellied candy. Insert licorice vines for legs, poking through the other side and pulling them through. Use toothpick to create small holes in "head" and insert two miniature chocolate chips as eyes. Stand two large marshmallows on end, top with cinnamon hots or raisins for eyeballs, in cross-eyed fashion. Place large marshmallow on it's side. Use a toothpicks to poke three holes on each side of marshmallow to insert legs. Use licorice vines for legs, gently press into the holes. Use two miniature chocolate chips for eyes. Stand two large marshmallows on end, top with Cherry Heads for eyeballs. lengthwise. Cut triangular slits out of sides to create jawbone effect. Use toothpick to insert holes for eyes, use miniature chocolate chips. Cut a small piece off of a licorice vine for straight mouth, and a tiny piece for nose. Use a miniature marshmallow for the neck. lengthwise, but not completely. Unfold the marshmallow and lay it down, open side up to create the coffin. use a miniature marshmallow for the head, and body. Cut up a miniature marshmallow for the arms and legs. Use small pieces of licorice vine for the mouth and eyes. Place all ingredients except food coloring, into top of double boiler. Beat over simmering water with electric mixer 5-7 minutes or until mixture stands in peaks. Tint frosting orange by using several drops of yellow and red food coloring. Cream butter; add part of sugar gradually, blending after each addition. Add remaining sugar, alternately with egg whites then with 2 tablespoons cream until of right consistency to spread. Beat after each addition until smooth. Add vanilla and salt. Divide frosting in two parts. To one part add orange coloring to give an orange shade and spread between layers of cake, reserving about 1/4 for pumpkin decoration. To remaining un-tinted frosting, add chocolate; then add teaspoons cream until of right consistency to spread. Spread chocolate frosting on top and sides of cake Decorate top with jack-o'-lantern, made of orange-tinted frosting. Makes enough frosting to cover tops and sides of two 9" layers and for decorating. Cream margarine with electric mixer. Add powdered sugar gradually. Add vanilla and 2 1/2 tablespoons milk; blend well. If necessary, add more milk gradually to achieve desired spreading consistency. For Halloween Jack-o-lantern cookies, add red and yellow food coloring to make desired shade of orange. Ice cubes with raisins in them to look like "bugs"
2 1/2 cups juice from two 1-pound cans of spiced peaches. In a punch bowl combine all the ingredients and serve. Makes 20 cups. If you have a new clear plastic glove, fill it with any juice or even water. Fasten the glove closed with a twist-tie from a loaf of bread or rubber band and freeze it. When it is frozen, float it in the punch bowl just before serving. Makes a nice creepy effect. The plastic gloves can be purchased at a kitchen supply store or even some super markets. Put all ingredients in a punch bowl. Add ice cubes just before serving. Makes 14 cups. Mix together a 12 ounce can of orange juice concentrate, a 12 ounce bottle of white grape juice, 2 liter bottle of 7-Up, pint of lemon or lime sherbet, and several drops of green food coloring. A cauldron of punch made with grapes and orange peel masquerading as eyeballs and worms. With a vegetable peeler, pare peel (colored part only) from oranges; cut peel into hin 2-inch-long worms; or use an Oriental shredder to make long shreds. Add orange peel to cranberry mixture. Cover and chill at least 4 hours or as long as overnight. Juice oranges; put juice in a 6 to 8 quart pan or heavy bowl. Stir in cranberry-ginger mixture, the 3 cups cranberry juice, apple concentrate, limeade, grapes and water. If made ahead, cover and chill up to 2 hours. Add ginger ale. Ladle into cups. Scoop ice cream into a tall clear glass. Pour Orange soda over the top of the Ice Cream. Stick gummy worms into the drink so they hang over the edge of the glass. Add a straw (preferably an orange or black one) and enjoy. A favorite is a variation of any of the above punch's. You top it off with a small glop of "Cool Whip" or whipped cream. Than add a bit of red icing from a tube to make the eyes look blood shot. and top it off with a raisin or chocolate chip.